A group of seated men looking at the camera with a large brick building in the background. The men are said to be visiting Kodok, a fortified location of British administration and the site of the Fashoda Incident. Fashoda proper is some eight miles from Kodok and is the home of the Shilluk Ret. The Seligman's spent most time at this location in late 1909, although they also visited in 1921-22. Manual catalogue entry (thermofax catalogue copy in folder '27-06 Seligman Slide Collection') - "V.b.7. Group of Shilluk"
Note on lantern slide ms ink - "V.b.7. Sudan. 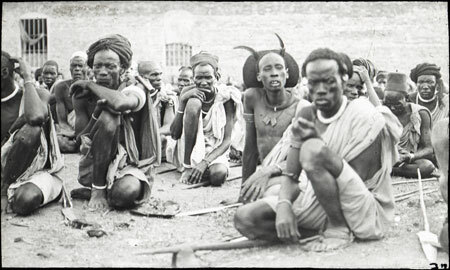 Group of Shilluk. CGS"
Morton, Chris. "Shilluk men " Southern Sudan Project (in development). 03 Jan. 2006. Pitt Rivers Museum. <http://southernsudan.prm.ox.ac.uk/details/1967.26.24/>.